Go ahead, complain about the color of Starbucks new holiday cup and the fact that it doesn’t say Merry Christmas or Happy Festivus on it. While you’re complaining, I’ll be busy cashing in on the savings during Starbucks Happy Hour this afternoon from 2 to 5 pm when participating Starbuckeries will be offering two holiday beverages for the price of one. 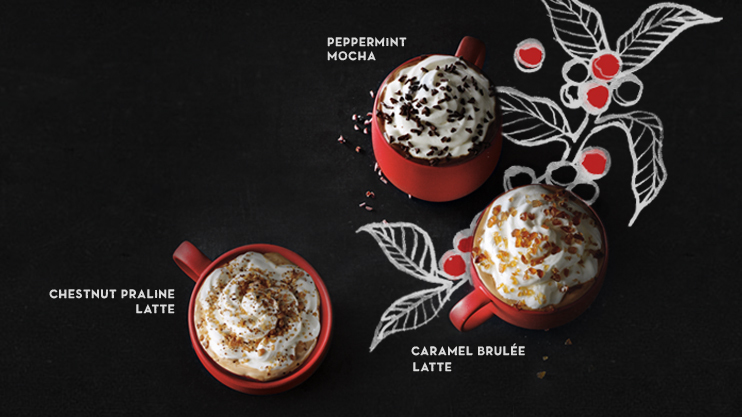 This year’s holiday options are Chestnut Praline Latte, Peppermint Mocha and Caramel Brulee Latte….hey, wait a minute. What happened to Egg Nog? I am a Judeo-Christian-Buddhist-Deist-Agnostic and I demand the right to my egg nog. It is the lord-given right of every man, woman and child in this country to have egg nog at this time of year…or whenever they want it, really, without having to embarrass themselves by ordering a so-called Tom & Jerry. And I think we should all stand up for our rights and not just ask, not just request, but DEMAND our right Noggy goodness whenever we damn well please. In fact, I’m going to hold Starbucks responsible for the fact that grocery stores and ice cream stands stop selling eg nog ice cream on January 1. Because they company is big, soulless, non-responsive and doesn’t care what the people want…even though I’m the only person who wants it. When you participate in Starbucks Happy Hour from 2 to 5 pm now through Nov. 15th. If you are a My Starbucks Reward Member, the deal extends through the 16th. And if your a member of My Nog Rewards Club, you get absolutely nothing…..especially not an egg nog latte. I love the cups. I don’t go much to Starbucks, but snowflakes and such are natures creations, so please bring them back. Thank you.